Gardaí have not released details of the post-mortem carried out on the man’s remains but say this is now a murder investigation. GARDAÍ ARE CONTINUING to investigate the discovery of two bodies in the River Bandon with two people appearing in court last night charged with the murder of one of those discovered in the West Cork town in recent days. The investigation into the death of a second man whose body was recovered from the river yesterday morning has been upgraded to a murder inquiry. The preliminary results of a post-mortem examination carried out on the remains last night have not yet been released. The man has been identified as 42-year-old John Forrester believed to have originally come from Blackpool, England but who was living in Bandon. His date of birth is 5 April 1969. Gardaí are anxious to contact Forrester’s family and are appealing to anyone who may have any information about where he came from or his family details to contact Bandon Garda Station on 023 885 2200, the Garda Confidential Line 1800 666 111, or any garda station. Investigators are also still appealing for any information regarding his death, and they can be reached through those phone numbers. Separately, two people appeared in court last night charged with the murder of Jonathan Duke whose body was recovered from the River Bandon on Sunday night. A 35-year-old woman, Catherine O’Connor, and a 37-year-old Romanian national, Ciprian Grozavu - both of Bandon Bridge House – appeared at a special sitting on Bandon District Court last night, RTÉ reports. The two were remanded in custody to appear again before the district court on 21 November. O’Connor will also be psychiatrically assessed on her arrival at Limerick prison where she will be held until the next hearing. 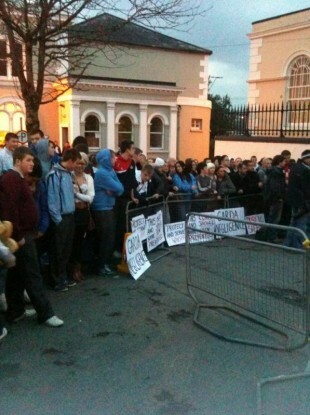 Cork Evening Echo reporter Helen Grace Walsh tweeted pictures from outside the courthouse where she said hundreds of people had gathered to see the accused taken into court for a hearing that lasted seven minutes. Email “Latest River Bandon investigation upgraded to murder”. Feedback on “Latest River Bandon investigation upgraded to murder”.